Learn how to remove Mac File Opener from Mac OS X to prevent annoying popup dialogs and fake malware detection alerts that push other infections. The case of the Mac File Opener applet is way off the beaten track. First of all, that’s because its reputation is questionable, to say the least. Secondly, there appear to be apparent ties between it and the infamous scareware called Advanced Mac Cleaner. Moreover, the two are often installed as a combo, where a user’s consent is taken out of the equation. Another reason why quite a few antimalware suites flag this product as malicious is the deceptive practices it leverages to achieve bad goals. When a victim attempts to open a file that isn’t supported by any software on the machine, Mac File Opener goes as far as overriding the regular system routine and displays a bogus dialog pointing to its own web page. The undoubtedly dubious marketing employed by the app in question actually starts from the very installation. While routinely surfing the Internet, Mac users may unwittingly click on some ostensibly safe link that reroutes them to advancedmaccleaner.com/mobf landing page related to Advanced Mac Cleaner, a rogue system optimizer mentioned above. 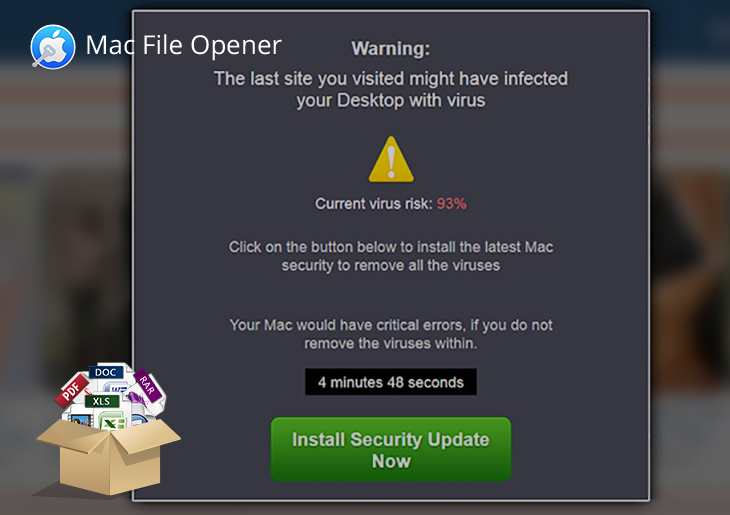 The website generates a spoof security warning that reads, “The last site you visited might have infected your Desktop with virus.” The effect of trustworthiness and urgency is enhanced by the indication of current virus risk at 93% and a clock counting down 5 minutes before the Mac begins acting up due to inexistent viruses. No wonder people end up installing the recommended “security update” from that page. The perpetrating file is in .pkg format and weighs 5.4 MB. Once it is downloaded and the setup goes all the way, the Advanced Mac Cleaner pest appears and runs on the targeted computer. The subsequent chain of events is quite unusual. It turns out that the installer also promotes Mac File Opener, the application under scrutiny. While exhibiting no straightforward behavior, this app actually revamps the whole ‘file – software’ association workflow. In other words, if an infected person doesn’t have a tool to open a specific format of data, the malware in question triggers a phony popup which, unlike its legit counterpart, doesn’t provide manual application selection or App Store lookup functionality. Aside from canceling the file opening attempt altogether, the only productive option left is to hit the Search Web button. That’s where another ‘fun’ part commences. The victim ends up visiting the offending app’s homepage at macfileopener.com. The website contains a list of file extensions supported by Mac File Opener and may also recommend the user to run a free scan to check for potential malware threats. This is, obviously, another fragment of the crapware promotion loop. All in all, considering that Mac File Opener is installed without proper authorization and then replaces regular system notifications with its own, it doesn’t belong on a Mac. 1. Download and install MacBooster application (read review). The tool provides both optimization and security features for your Mac. Before you get down to obliterating Mac File Opener virus proper, consider checking your machine for other security risks and performance issues by hitting the Scan button. 2. Proceed to the Uninstaller feature, find Mac File Opener on the Applications list and have MacBooster completely eliminate all components of the app from your Mac by clicking Uninstall in the bottom part of the GUI. Doing so will ensure all components of the malware and its remainders, which may have not been removed in the manual way, will be thoroughly cleaned up.